But who eats only an ounce of chips? Maybe a Buddhist monk somewhere, real people want more. How much is an ounce of chips anyway? I weighed some out. As you can see in the photo here, it’s not much, less than a dozen chips at best. I then filled the bowl and weighed it again. I had four ounces at that point. That’s less than I would have eaten during a football game in the past, but it’s more than my limit now. Those four ounces gave me 24 grams of fat, more than half my daily allowance of 40 grams. They put me over my daily allowance the Sunday I had them, so eat sparingly, even when you have salt-free chips. 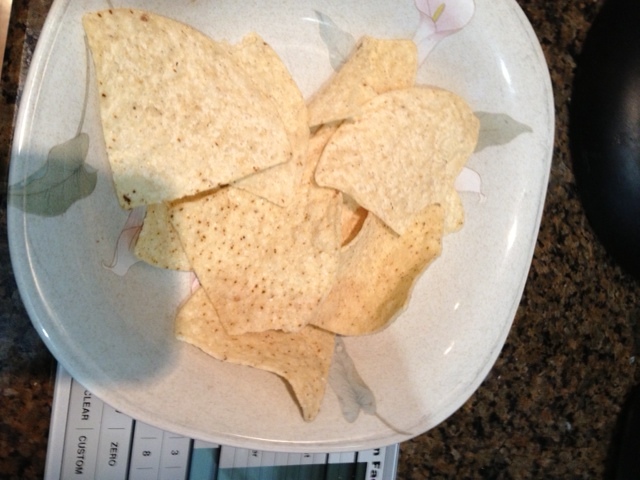 And if you know of a fat-free, salt-free tortilla chip, let me know, my bowl is empty right now. UTZ made a 0 fat chip. discontinued.